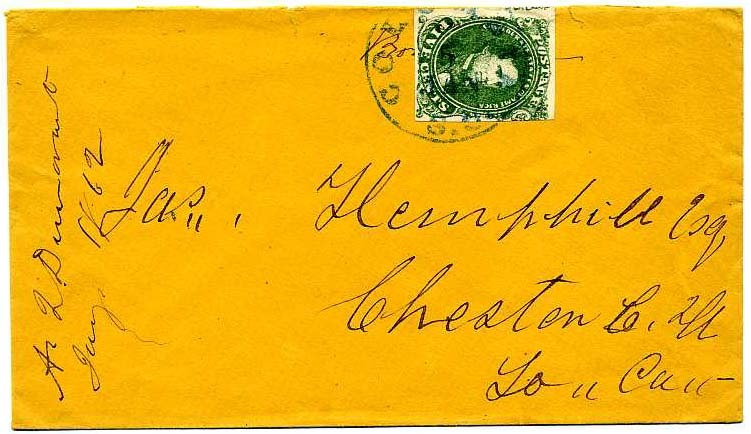 CSA 1, 5¢ bright green with pre-use crease tied neat blue RALEIGH / N.C. dc cancel on clean homemade cover to Petersburg, Va.] $275. 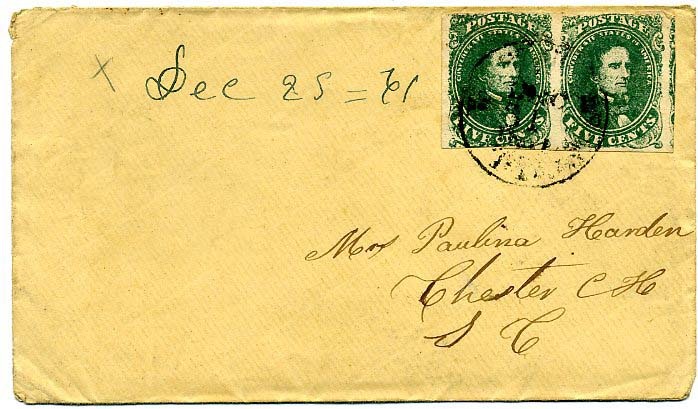 CSA 1, 5¢ bright green pair showing parts of adjacent stamps at right tied TUDOR HALL / VA / DEC/31/1861 cds on neat commercial cover to Paulina Harden, Chester C.H., S.C., docketed Dec 25 '61, Very Fine] $450. 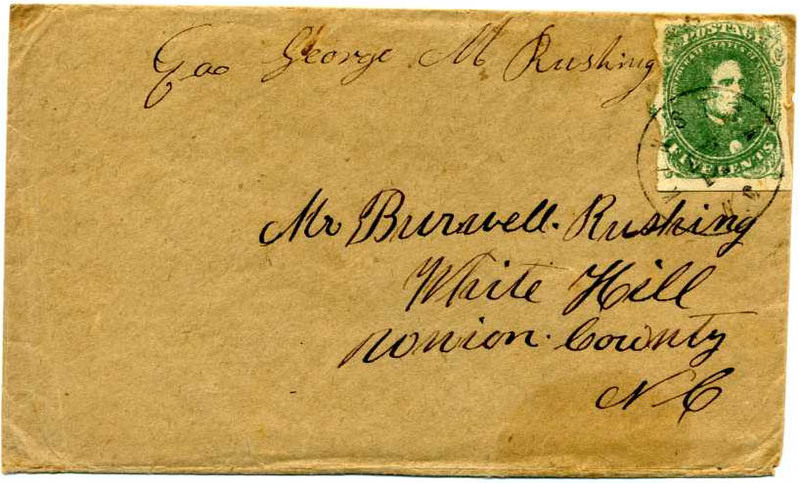 CSA 1c, 5¢ Olive green, Stone A or B, horizontal pair tied by light FREDERICKSBURG / VA / PAID on cover to Castalian Springs Tenn., Very Fine. Description on verso by Van Dyk MacBride. $500. 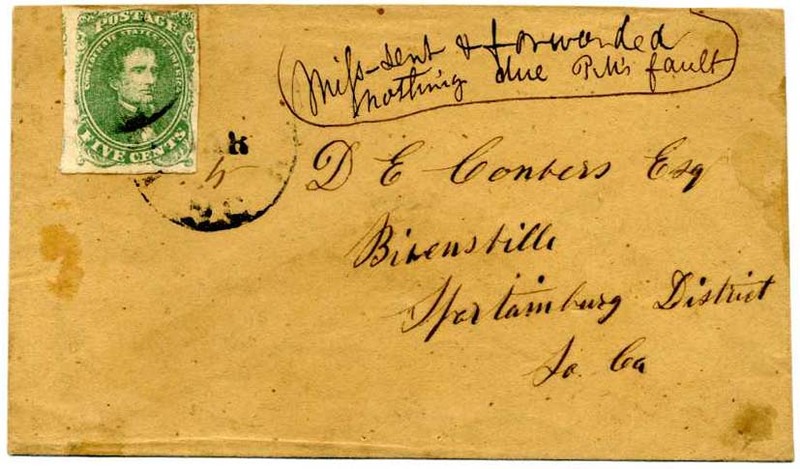 CSA 1c, 4-margin 5¢ olive green Stone 1 canceled with blue target and matching CHARLOTTESVILLE / VA / MAR / 3 / 1862 cds on commercial cover to Arrington, Va., small cover edge tear at top, Ex Engstler. $280. 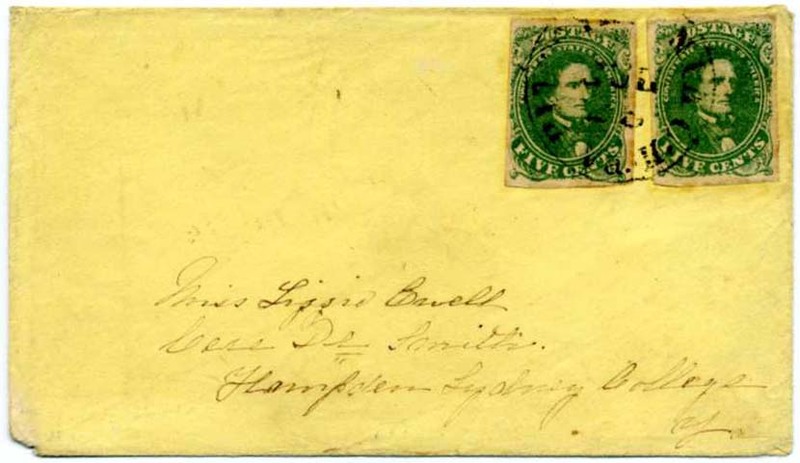 CSA 1, 5¢ green tied by large blue CHARLOTTE / NC / DEC / 12 (1861) cds on cover to "Mr. Joseph B. Friend, Drakes Branch Deport R .D .R." 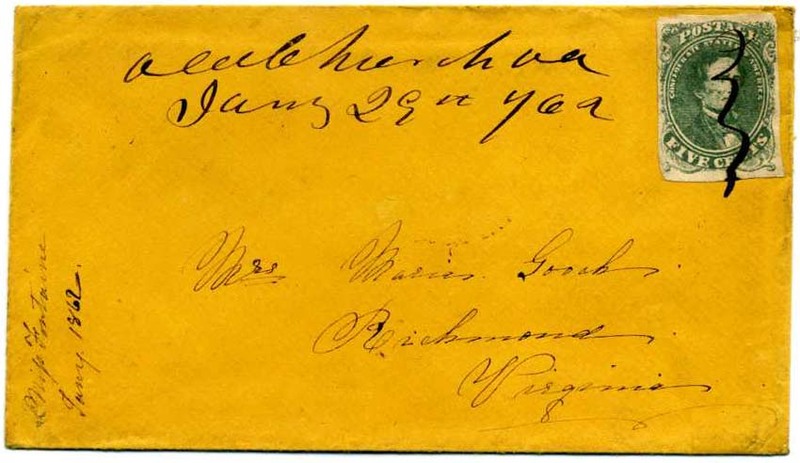 (Richmond and Danville Railroad, later the Southern) $290. CSA 1c, 5¢ olive green stone 1 with small faults, tied by CULPEPER C.H . 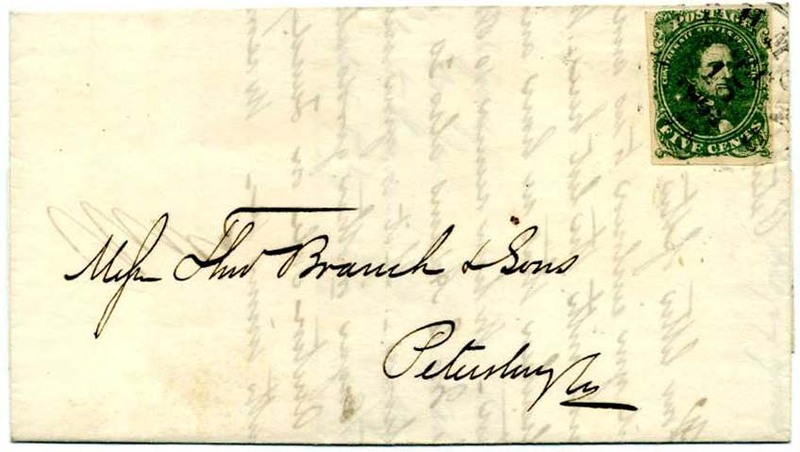 / VA. cds, date not evident but is late 1861 or early 1862 on fresh plain brown cover to "Ed. B. Smith Esq. University of Virginia Charlottesville". $170. CSA 1, 4-margin 5¢ green tied KNOXVILLE / TENN cds to A. G. Weleker, Esq. Chattanooga, Tenn. on cover made from brown wrapping paper. Very Fine. $275. 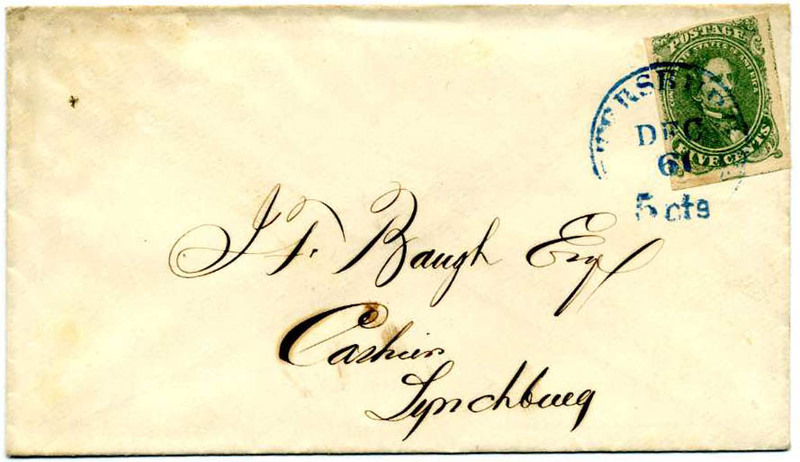 CSA 1, 5¢ green, 4 margins, tied bold blue LYNCHBURG / Va. // MAY 27 (1862) cds on homemade cover addressed to Manchester, Va. $270. 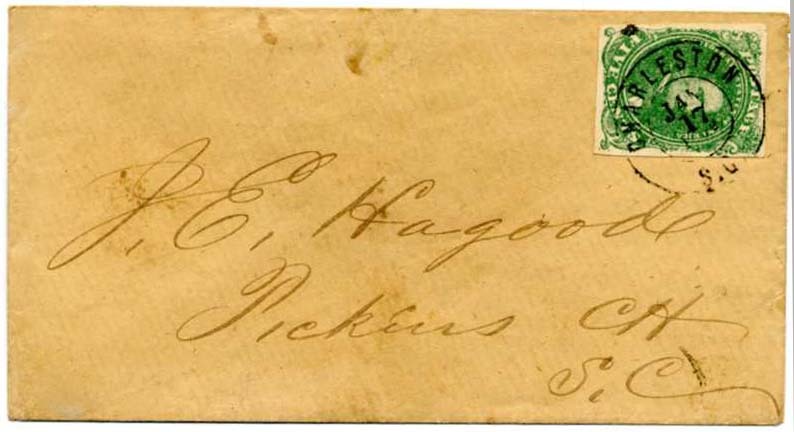 CSA 1, 5¢ green with small corner scuffs in UR and LR margins, tied neat RICHMOND / VA // FEB / 27 / 1862 cds on blue commercial cover $160. 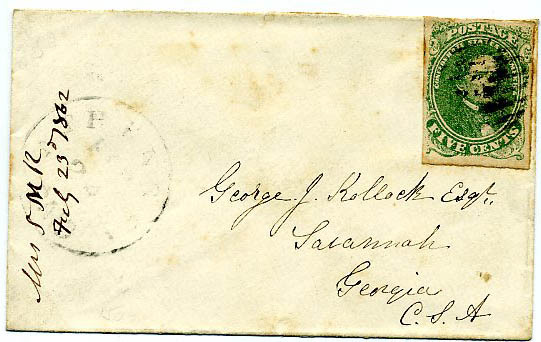 CSA 1, Stone 2, 5¢ green grid canceled with matching ATHENS / GA cds on small cover to "Savannah, Georgia CSA" $170. CSA 1, 5¢ green tied MEMPHIS / Ten. 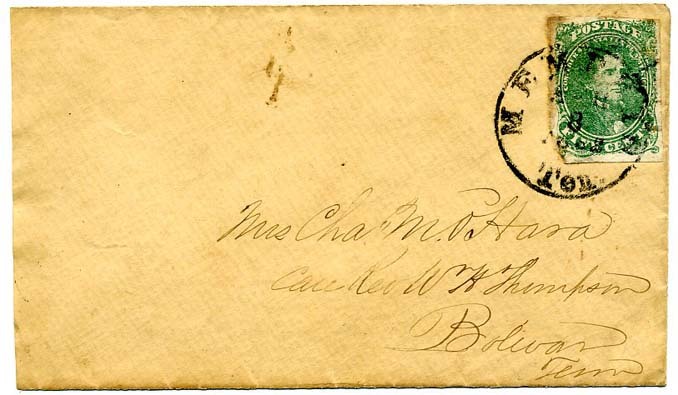 1862 cds on cover to "Mrs. Chas m. O'Hara Care Rev W. H. Thompson, Bolivar, Tenn.", Ex Powell. 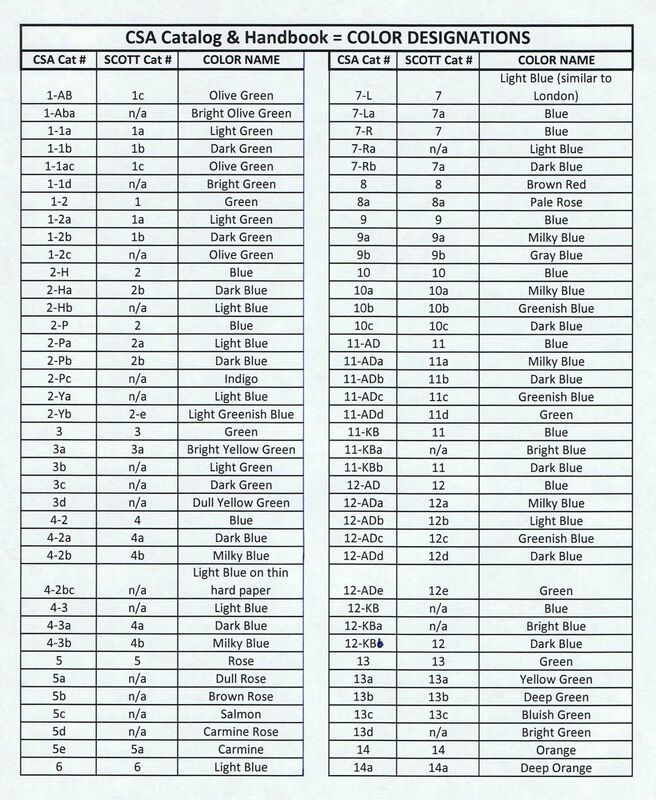 CSA 1, 5¢ green top sheet margin copy, probably Stone 1 (Stone 2 EKU December 2) tied TUDOR HALL / VA. / DEC / 1  to Buckingham, slightly reduced at left otherwise Very Fine. 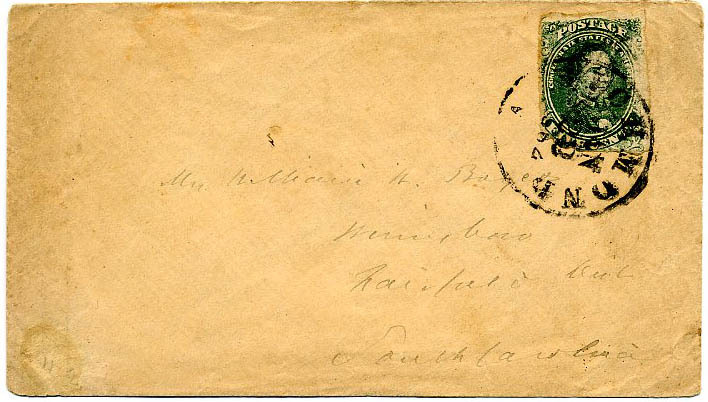 CSA 1, 5¢ green Stone 2 with short transfer at right and small faults, tied bold RICHMOND / Va. / JAN / 22 / 1862 CDS on cover. $150. 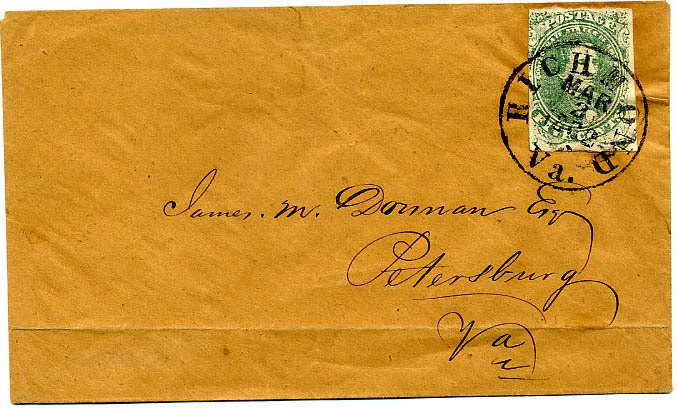 CSA 1, 5¢ green, Stone 2, tied neat bold RICHMOND / Va . / MAR / 2 / 1862 cds on neat cover to "James M. Dorman, Esq., Petersburg, Va.", back flap tears and small piece missing, light file fold across bottom, fresh and pretty. William E. Paxton was a well-known and respected attorney and editor of the Southern Banner in Sparta. He raised the Bienville Rifles. Much more information on linked page. 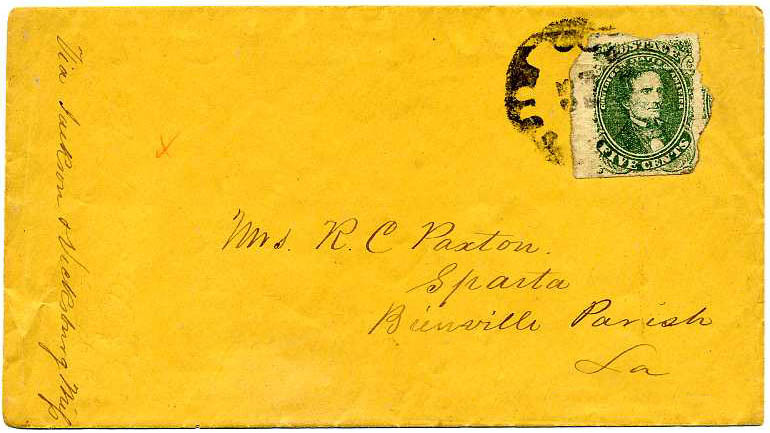 CSA 1c, 5¢ olive green, deep rich shade and clear impression indicative of Stone AB although not plated; tied on fresh homemade cover by blue PETERSBURG / Va. // DEC / 7 (1861) cds; addressed to “Dr. 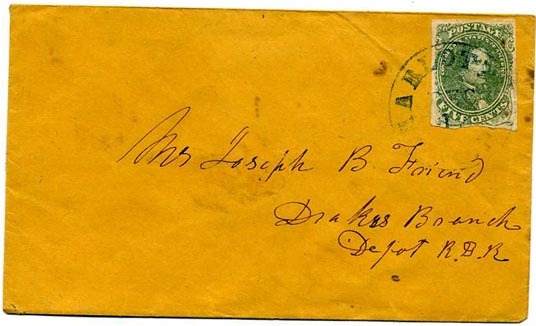 A. C. Harris, Sassafras Fork, Granville County, No., Ca.”; missing top back flap, tiny sealed edge tear at top. 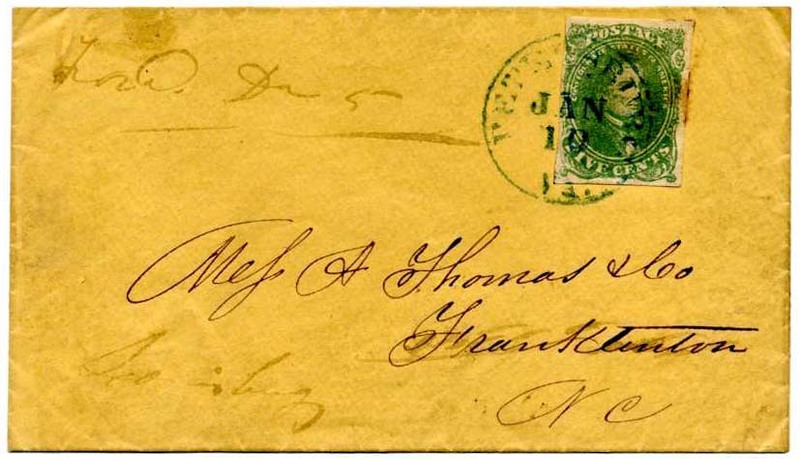 CSA 1, 5¢ green and 5¢ blue (stamps with faults) mixed franking tied together by blue PETERSBURG / VA. cds over printed corner card of Evangelical Free Society to “Mr. Collin Stotes, Lunenburg, Va New Plymouth Post Office” with note after address “To the postmaster please forward this as soon as possible in haste,” Ex Hubbell and Tobias. 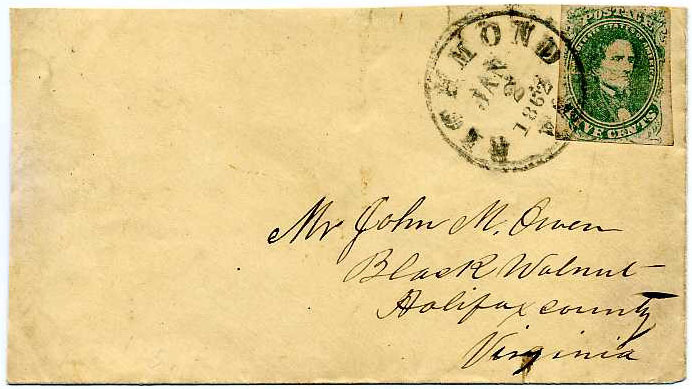 CSA 1, 5¢ green tied RICHMOND / Va JAN / 2 / 1862 cds on cover to Black Walnut, Va.; stamp has pre-use sealed tear, tiny cover tear at top and top back flap missing. 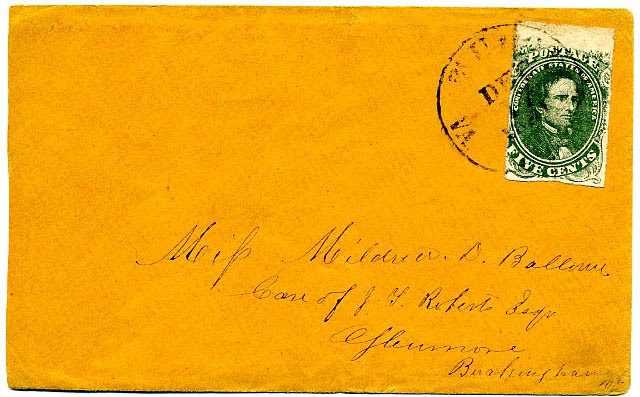 CSA 1, 5¢ green tied neat bold GEORGETOWN / S.C. / MAR / 20 / 1862 cds on cover to “Mrs. Thomas W. Porcher, Pineville P.O. 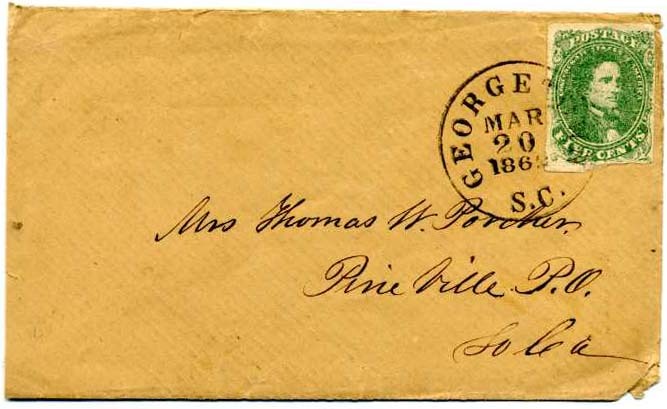 , S.C.”, slightly reduced at left. Porcher was related to European royalty and owned large plantations in South Carolina; information on the Porcher family is readily available online. CSA 1, 5¢ green tied NEW ORLEANS / LA. 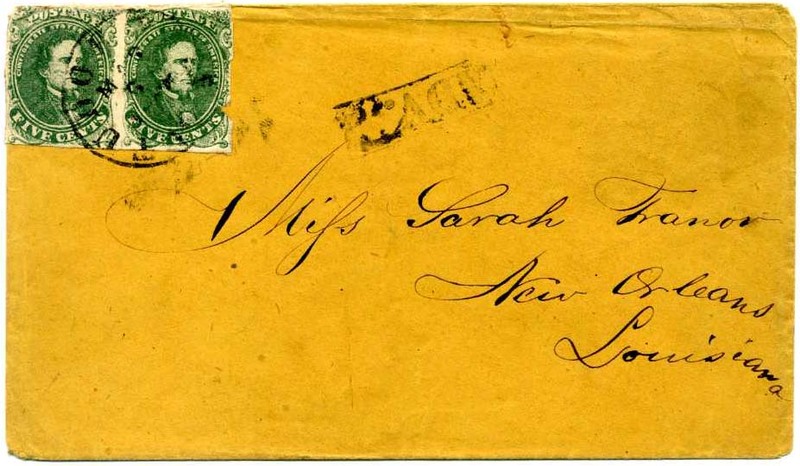 APR (1862) cds on cover to “J.N. 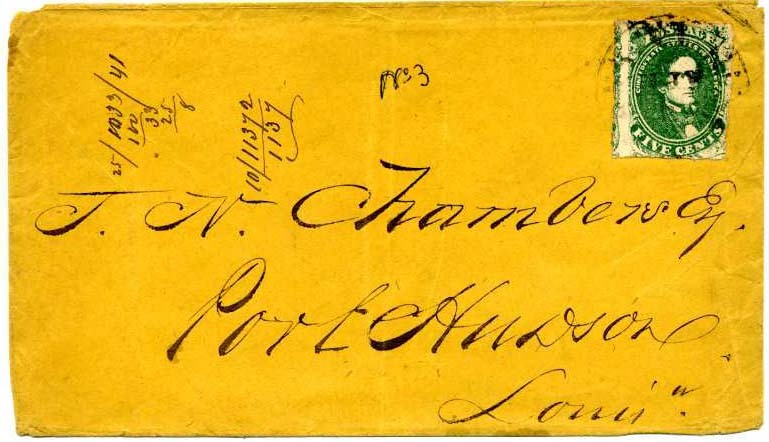 Chambers Esq., Port Hudson, Louisn”, docketed on verso as from Montgomery & White 1st April 1862. 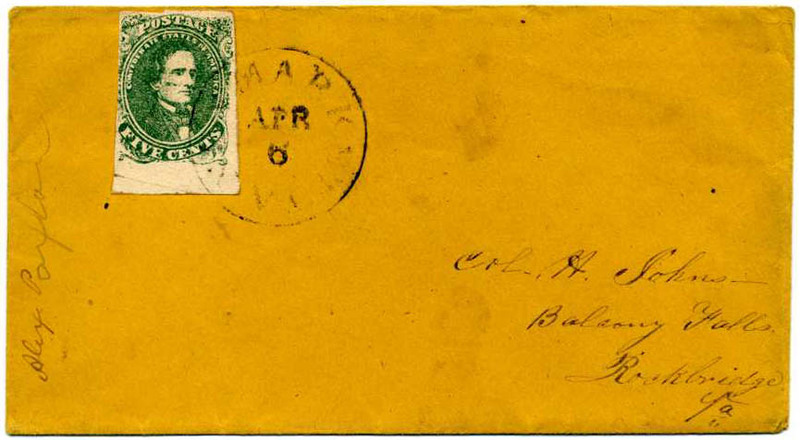 CSA 1, 5¢ green bottom sheet margin (crease in margin at lower left) tied neat NEW MARKET / Va. / APR / 6 (1862) cds on cover to “Col. H. Johns, Balcony Falls, Rockbridge, Va” and and docketed (from) Alex Paxton along left side. $250. 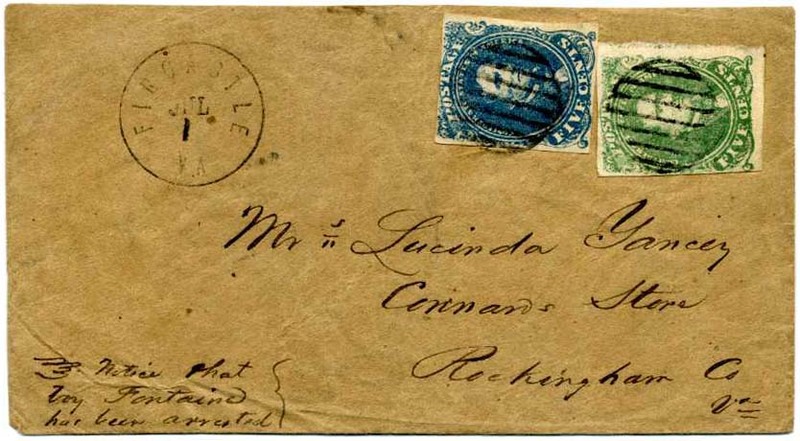 CSA 1 and 4, 5¢ green (tiny tear) and 5¢ blue tied in combination on homemade cover by neat grid cancels with matching FINCASTLE / VA. // JUL / 1 (1862) cds, scarce and desirable FIRST DAY of the 10¢ Rate, Cover addressed to “Mrs. Lucinda Yancey, Connan’s Store, Rockingham Co, Va.” with note at lower left “Notice that boy Fontaine has been arrested” – likely referring to a captured runaway slave. Flap missing. Knapp plating on verso as Stone 3, position 6 and Stone 2, position 46. Ex Knapp and Tate. A key date for an exhibit. 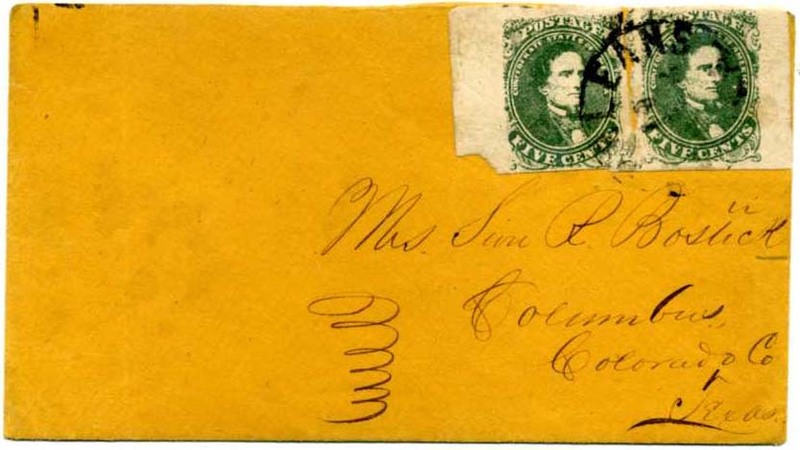 CSA 1, 5¢ green tied CHERAW / S.C. // MAR / 15 (1862) cds on folded business letter to Mt. Pleasant, N.C., file fold splits, Very Fine. 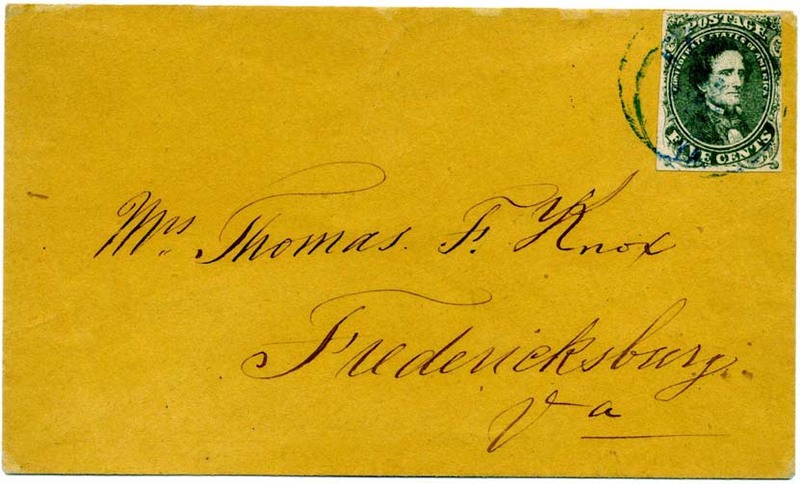 CSA 1, 5¢ green tied RICHMOND / Va. / DEC / 15 / 1861 cds on folded business letter to “Mssrs Thos Branch & Sons, Petersburg, Va.” from Dunlop, Moncure & Co., Very Fine, Ex Tate. 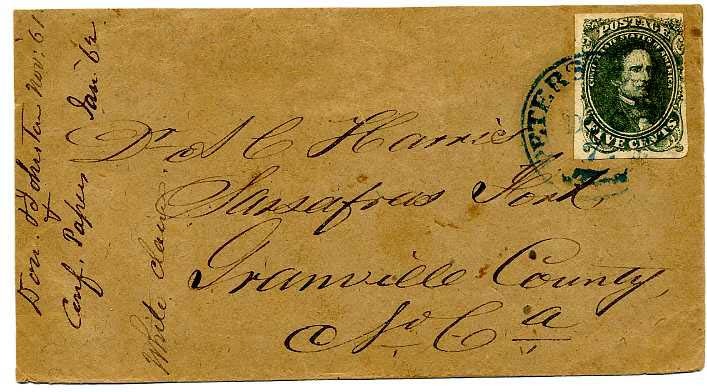 CSA 1, 5¢ green pair tied TUDOR HALL / VA / MAR / 6 / 1862 cds, right stamp is the “filled up FIVE CENTS” variety with small nick at right margin, on cover to “Miss Sarah Tranor, New Orleans, Louisiana”. Scarce boxed “ADV. 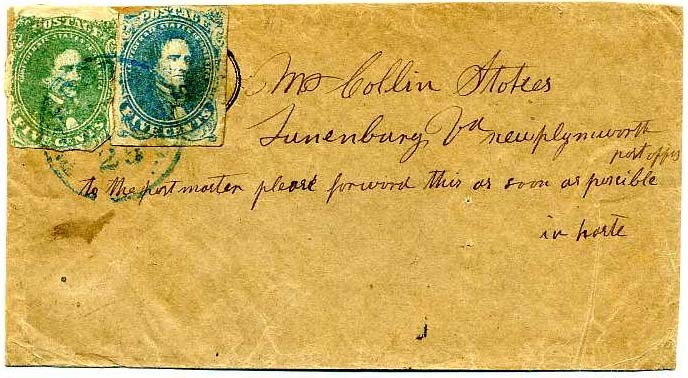 1” handstamp indicating that the cover was advertised in the newspaper for pickup. Ex Tate. 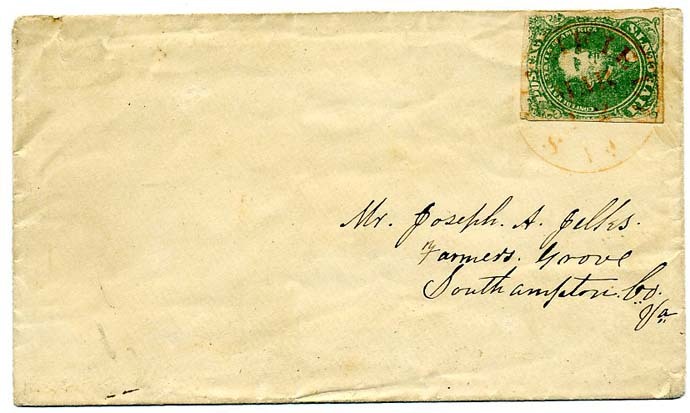 CSA 1, 5¢ green tied blue NORFOLK / VA double circle cancel on pristine cover that has been silked with a couple of small closed tear, Very Fine. Ex Tate. 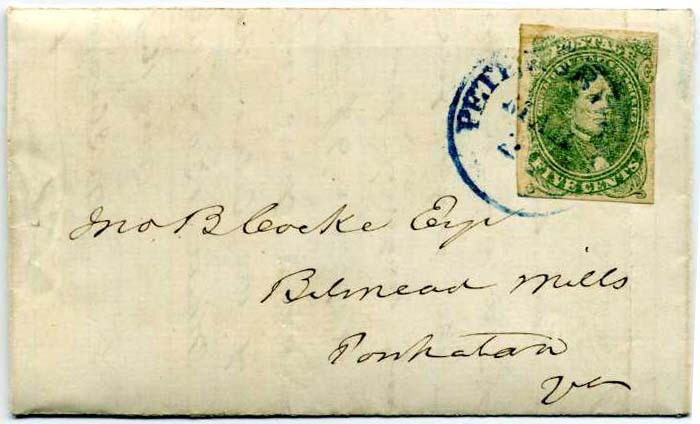 CSA 1, 5¢ green tied blue PETERSBURG / Va. MAR / 21 (1862) cds on pristine folded business letter to “Jno B. Cocke Esq, Belmead Mills, Powhatan (Co), Va.” for the “Sale of 18 bbls flour on a/c of Meherrin Plantation” addressed “To Patterson” and signed McIlwaine So & Co. The Cocke family was well known and produced numerous famous Civil War era personages including Gen. Philip St. George Cocke who committed suicide. 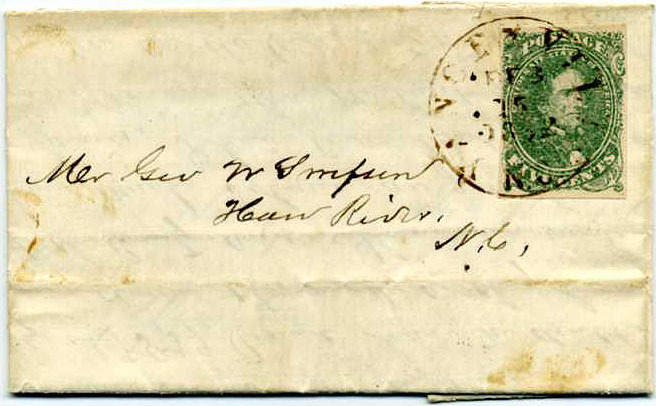 CSA 1, 5¢ green tied blue PETERSBURG / Va. / JAN / 10 (1862) on lemon cover to “Messrs A Thomas & Co Franklinton, NC” which address has been crossed out and redirected to Salisbury, NC with manuscript “For(warde)d Due 5” at upper left. CSA 1, 5¢ green (4 margins) tied neat clear GREENVILLE C.H. 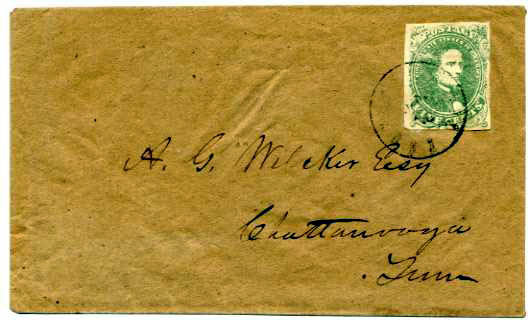 / S.C. // FEB / 20 (1862) double circle cancel on commercially made pale pink envelope of laid paper (missing top back flap) to“Segt G(eorge). P. Anderson, Capt. 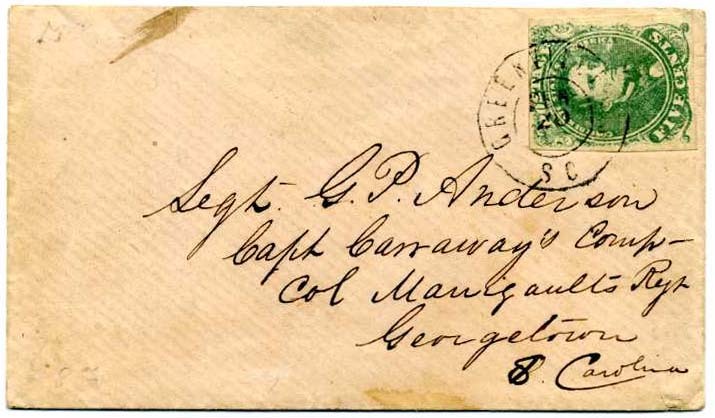 Carraway’s Corps, Col. Manigaults Regt Georgetown, S. Carolina”. $350. CSA 1, 5¢ green tied WINDSOR / N.C. cds on cover to “D.E. Convers Esq, Biensville, Spartanburg District, So.Ca.” with manuscript “Missent & Forwarded nothing due PM’s fault”, unusual and interesting use $300. 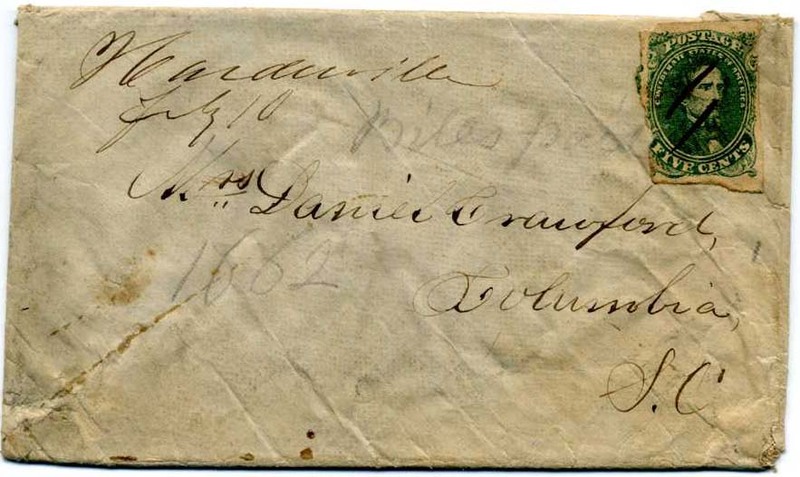 CSA 1, 5¢ green underpaid use with manuscript Hardeeville July 10 (1862) cancel on linen lined “money envelope” to “Mrs. 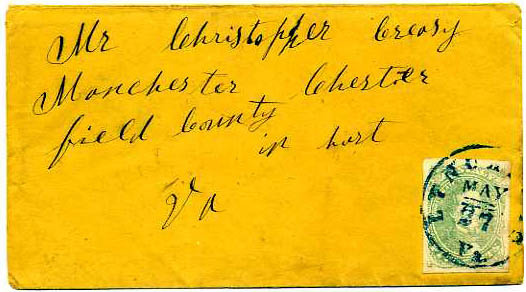 Daniel Crawford, Columbia, S.C.”; pencil docketing “Bills paid 1862”. 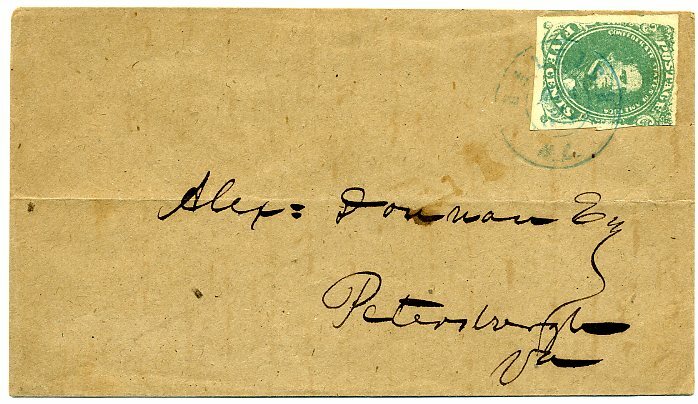 Postal authorities looked the other way on the rate as was sent by a soldier who could have sent it “due”. $200. Captain Daniel H. Crawford, A.Q.M. served in McLaw's Division in 1863, and later Longstreet's Division. Much more information on linked page. 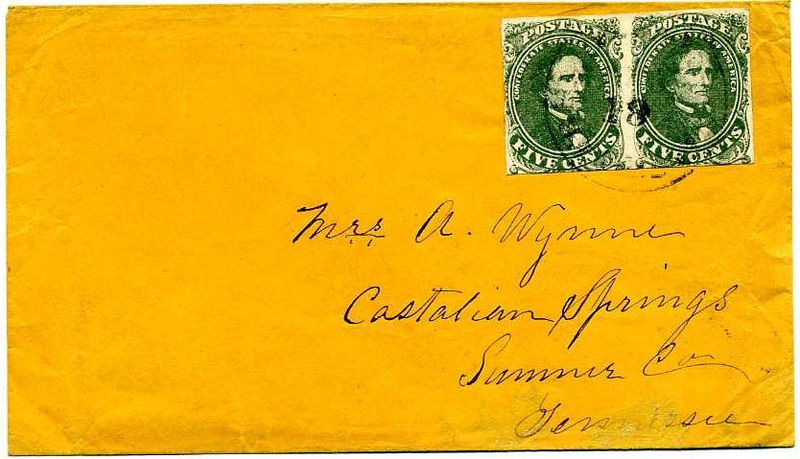 CSA 1, 5¢ green, stone 2, two singles with large even margins, tied by PITTSYLVANIA C.H., VA. / JUL 25 cds on lemon cover to “Miss Lizzie Ewell, Care Dr. Smith, Hampden Sydney College, Va.”, minor corner wear at bottom left, Extremely Fine and choice with 1983 P.F. certificate. $425. 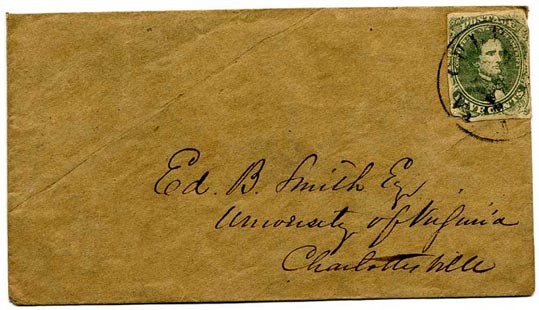 CSA 1, 5¢ green with large even margins tied by neat CHARLESTON / S.C. / JAN / 17 double circle cancel on cover to “J.E. Hagood, Pickens CH, S.C.” $300. 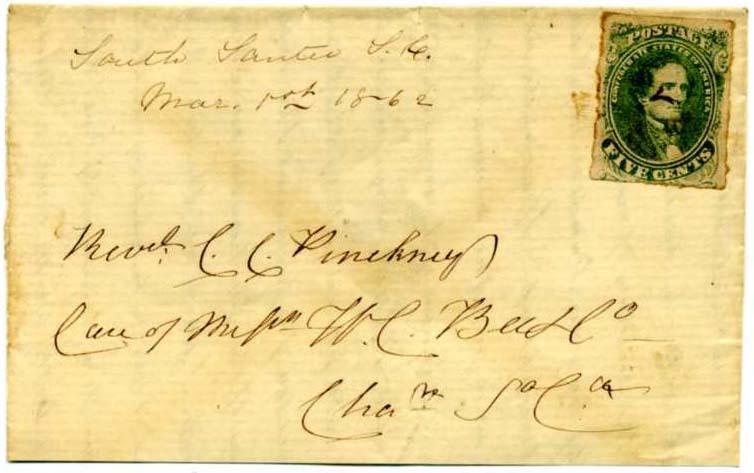 CSA 1, 5¢ green plated by prior owner as stone 1, used on part of folded letter with manuscript cancel of South Santee, S.C. May 1st 1862. $160. 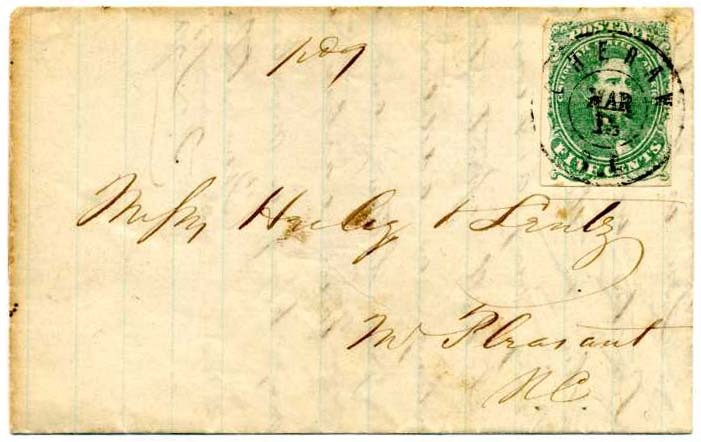 CSA 1, 5¢ green tied neat strike YANCEYVILLE / N.C. // FEB / 15 / 1862 cds on folded letter. Cancel appears brown, but is likely degraded red. 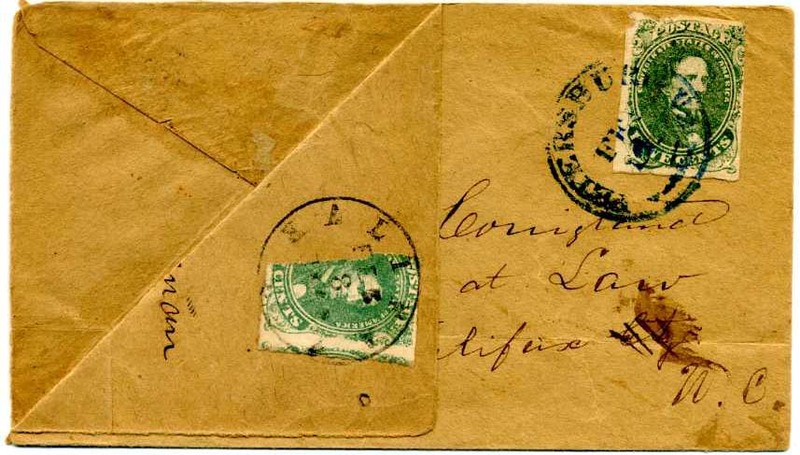 Small section of letter eaten away or cut out, probably to disguise sender. Ex Jack Solomon. $450. 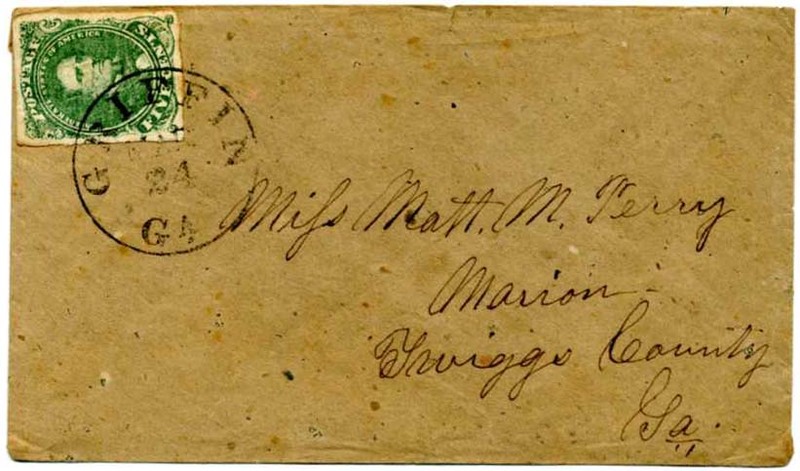 CSA 1, 5¢ green (4 margins) tied GRIFFIN / GA. // MAR / 24 (1862) cds on cover homemade from recycled newsprint, addressed to “Miss Matt M. Perry, Marion, Twiggs County, Ga.”, Very Fine, Ex Crouch. $400. 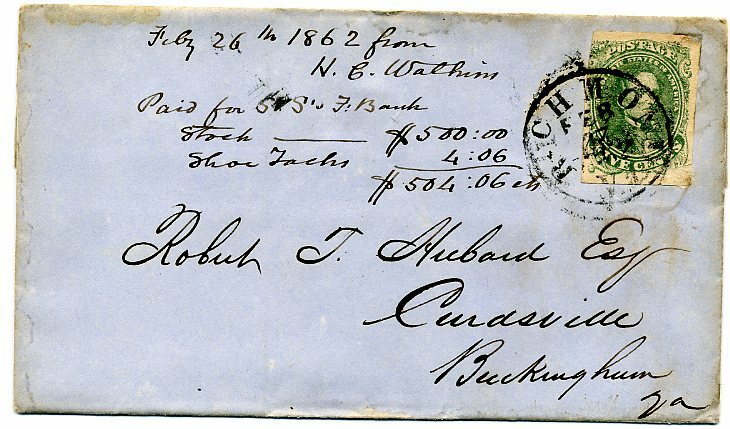 CSA 1, 5¢ green with light crease in bottom margin, tied blue PETERSBURG Va. / 5 cts / DEC / 19 (date inverted) , likely Stone 1 but not plated, on cover to Lynchburg. $200. CSA 1, 5¢ olive green, Stone 1, 4-margin copy tied on cover with “Old Church Va Jany 29th / 62” manuscript cancel on cover to “Mrs. 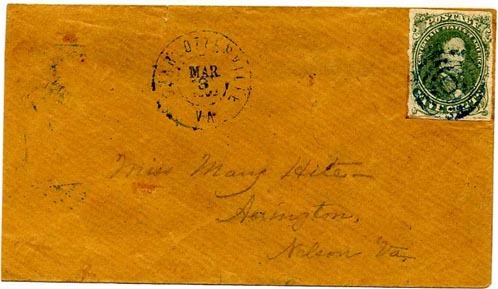 Maria Gooch, Richmond, Virginia” with docketing indicating contents were from Miss Fontaine, Very Fine. $250. 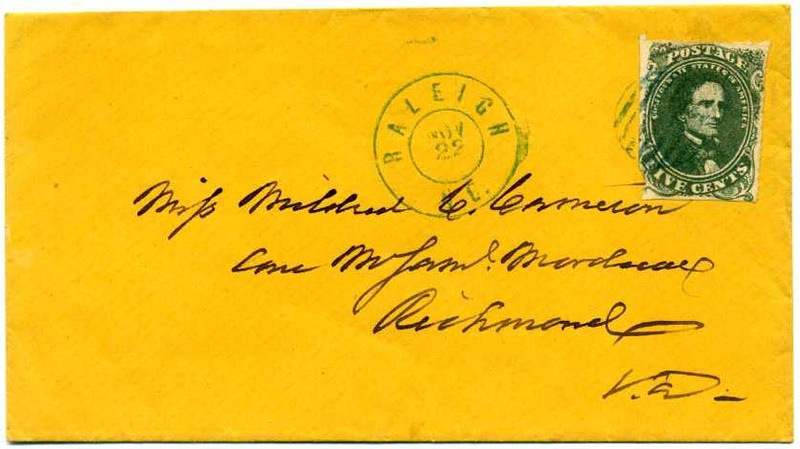 CSA 1b, 5¢ dark green, Stone 1 (LL corner clipped) tied blue grid with matching RALEIGH / N.C. // NOV / 25  on pristine cover to Miss Mildred C. Cameron Care Mr. Samuel Mordecai, Richmond, Va, Very Fine $250. 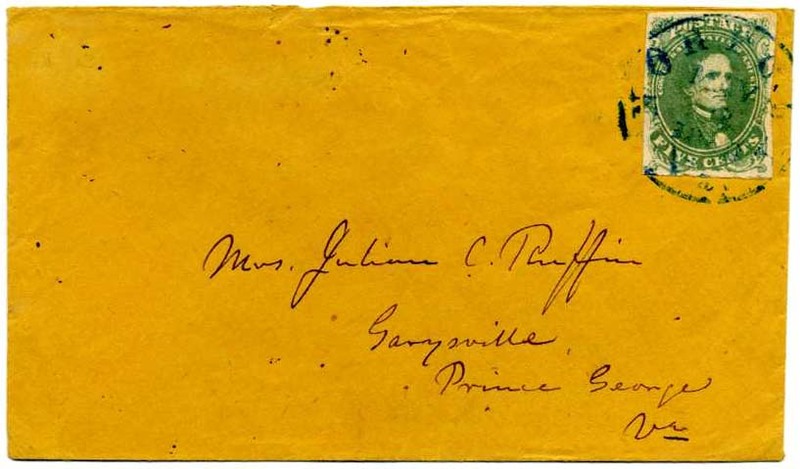 CSA 1, 5¢ green tied neat blue NORFOLK / Va. // MAY 1862 cds on cover to Mrs. Julian C. Ruffin, Garysville, Prince George, Va., part of top back flap missing. Ex Hunter M. Thomas, Jr. $200. 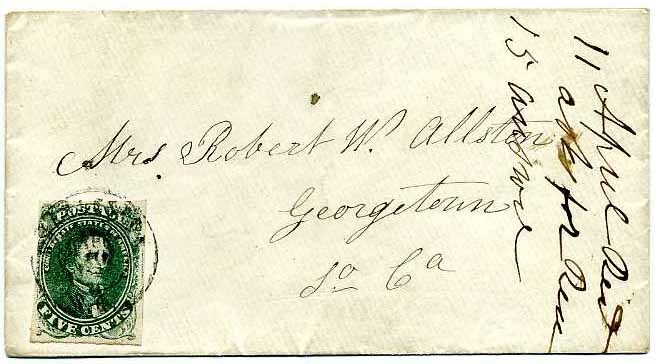 CSA 1-ABc, 5¢ olive green, (4 margins) tied on cover by RICHMOND / VA. // OCT / 20 / 1861 – EXTREMELY EARLY use 4 days off the original date of issue on October 16, 1861. 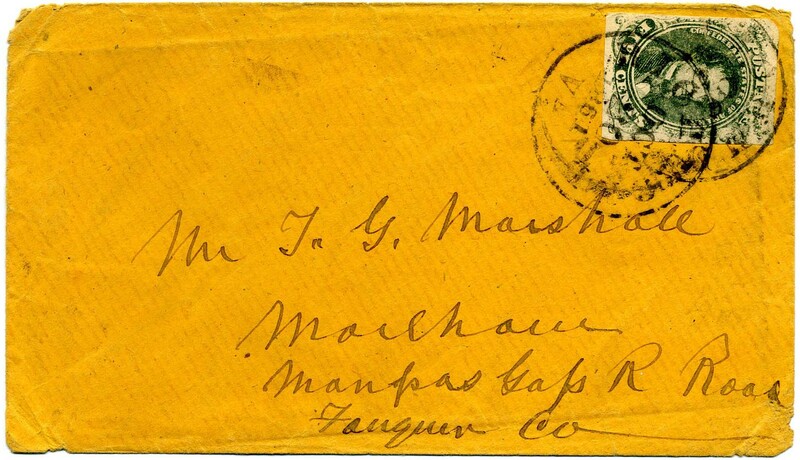 Addressed to T. Y. Marshall, Morehouse, Manassas Gap R. Road, Fauquier Co[unty Va.] $300.